nice work, it´s looks fantastic, i think you really love a sims and everything about a flying. I hope maybe at some day i can start build my own pit. 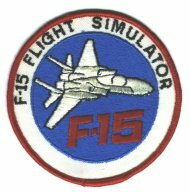 My favorite jet is F16. Really nice to have you back online again. Thought the project had come to a halt with no updates or anything put out from this site for such a long time. I have been looking in when ever i get a chance and am knocked out by the way everything looks now Keep up the great work . Having been an airframe specialist @ Bitburg, Germany near the time of 007 crash, I will follow your progress with much anticipation of each new development. I am very impressed by your attention to detail and if you require any advice from an old Eagle fixer, I will give it my best shot. Keep it up! Thanks for the note Wally! The cockpit was used as an ABDR trainer for a while and there are some nasty looking patches in places. Any advice on replacing small skin patches would be greatly appreciated! Found this site by lucky chance. As it turns out, I saw your plane crash when it came down in Soesterberg. I was a kid in those days, but I still remember it well. I assume you know about this video? Greetings and good luck on your great project! Hi. You have donw a great job! I have was I was told that what I have is a Air Force procedures trainer simulator. It was completely stripped to a empty metal box. . There are no I.D marks on it? What do the rudder pedals and stick look .like? I not sure I have ability skill to what you did. I may use some commercial software to have some kind of simulator. Do you know of any one who would like to buy or trade my original USAF F-15 C Trainer metal cockpit . It is empty and is a great project for some one with the interest restore it. It does have some fairings in it. I can send photos if interested? I’d love to see pictures of that Walt!